Dynatrac™ introduces a solution for IFS 4x4s and KOH competitors that delivers an unmatched combination of strength, durability, size and value. The all-new Dynatrac ProRock XD60-IFS™ will take the abuse of high-horsepower and high-traction off-road tires, letting competitors use the skinny pedal without fear of breaking the differential. More than just legendary Dynatrac strength and durability, the XD60-IFS is also narrower than the competing axles at just 13.7 inches from flange-to-flange. This improves half-shaft angles and lets builders add suspension travel. The patented Dynatrac ProRock™ design also delivers best-in-class ground clearance and reduces the overall frontal impact area. It’s built to take impacts, so you can run a Dynatrac ProRock without a skid plate, freeing up even more ground clearance. As If just being better and stronger wasn’t enough, the ProRock XD60-IFS will have a suggested retail price of $5,995, which is $1,230 less than a similarly equipped axle from the competition. The new Dynatrac ProRock XD60-IFS starts with a centersection cast from high-strength nodular iron. Dynatrac designed the new centersection for increased rigidity, increasing the stability of critical tolerances during high stress for better durability, and it features exclusive larger carrier and pinion bearings for even more strength. 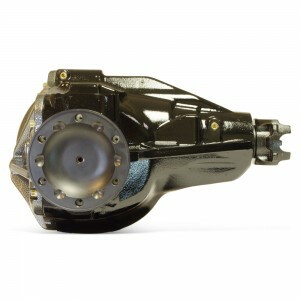 The axle was designed to hold a larger differential and 10.1-inch ring gear. This is a reverse-cut, high-pinion ring gear, which is far stronger than the competition. The ProRock XD60-IFS also has optimal cast-in features for air locker and electric locker connections, and the mounting points for the housing are an integral part of the casting. 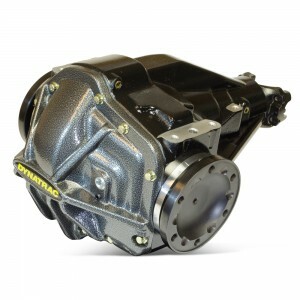 In addition to these engineering advancements in the centersection, the Dynatrac XD60-IFS features an all-new structurally-integrated differential cover designed to add strength to the overall housing an d to withstand brutal beatings in demanding off-road and racing conditions. The lower bolt heads are deeply embedded in the cover for skid protection, and the fasteners are the largest in the industry: 7/16-inch compared to conventional 3/8-inch. The RockRibs have been placed for optimal protection. 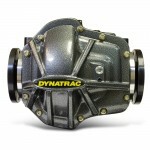 The Dynatrac ProRock XD60-IFS comes with 40-spline 4340 inner axleshafts and either 934 or series 30 flanges. The ProRock XD60-IFS accepts a full range of differentials, including air lockers and electric lockers. Gear ratios are available from 3.54:1 to 5.38:1. You can shop for the ProRock XD60-IFS by clicking here. For over 25 years, Dynatrac has been the industry leader in high-performance axle and drivetrain assemblies. Dynatrac products are designed using the finest materials, processes and engineering available, and its products are backed by the best service and warranty in the business. From complete replacement ProRock axle assemblies to high-quality replacement and upgrade components, Dynatrac is committed to delivering the best performance, reliability and quality possible.